The muggle side of me is getting married. We don't have a date yet, but there's so much to do that there's plenty of time. Plus, we're moving into our 1st place together in a few weeks. Yippee! I'm heavily leaning towards an Asian theme with orchids in the bouquets, lucky bamboo favors, Japanese lanterns twinkling around the yard (my parents), and possibly parasols for the ceremony during the daylight to block the Miami sun. My dress has been purchased (scroll down a bit to see it) and my girls and I are looking into a few choices for their dresses. *gasp* they get to choose! 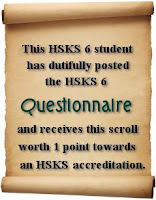 In other news, I received 2 badges in HSKS6! And I've been buying all sorts of fun gifts for my spoilee, Ceciley Fortescue, and just have to come up with/ decide upon a super cool pattern to knit for her.